A wider reach, a deeper authority, a greater giving. 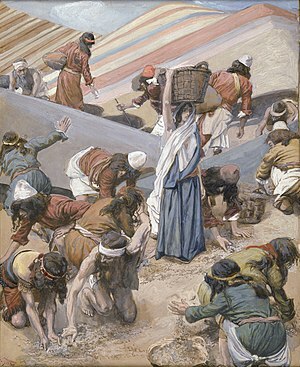 God provided Manna for Israel in the desert and as soon as Israel crossed into the Promised Land, the Manna ceased and the produce of the Land fed the Children of the Lord. The link between the two; God’s provision of the Manna and God’s provision of the vineyards, wells and abundance of the conquered tribes was supposed to be obvious. God provided Israel with both. Israel was never meant to forget who provided the daily bread, whether it fell out of the sky or was planted, grown, sifted, mixed with yeast and baked. The Triune God is a God of abundance, a God of Giving. Psalm 23:1 says “the Lord is my Shepherd; I shall not want.” The second half of the verse is the natural outcome of the first half. Because God is our Shepherd, we shall not want. The promise of God’s table is a promise of provision. Who among you is starving? Start with this basic necessity and move up and out and see all that God has given you. Start at the bottom, not the top, and work through God’s abundant provision and grace visible in your life today. Another thing is how boring, mundane and unremarkable daily bread seems when we buy it from Albertsons. We were born in a land of milk and honey and we forget all the labor others expend through God’s providence for our daily sustenance. We would be impressed by the miracle of Manna, but there are fewer specific items to be thankful for when the bread falls out of the sky. Bread from the store requires a far greater reach. God provides your job to acquire money, the car, the store, the plastic bag, the twist tie, the rain, the farmer, the harvest, the baker and an infrastructure which allows for massive ovens and transportation. So why are we less grateful when God displays a wider reach, a deeper authority, a greater giving? This is the common grace which we all so abundantly enjoy just to get some bread, everyday.